Do you have what it takes to hang with the Herd? Click here to download an application. Please return completed applications to TheHerd@FortWorth.com or by fax to: 817-740-8635. SUMMARY OF BASIC FUNCTIONS: This position will be responsible for performing duties directly related to the care and maintenance of livestock facility, property and equipment. This is a part-time position without benefits. Schedule is 6:30 a.m. – 3:30 p.m. and may be adjusted. We are a seven-day-a-week program and work on weekends and holidays. To apply, please submit your application to the Stockyards Visitors Center at 130 East Exchange Avenue or submit via fax to 817-740-8635. SUMMARY OF BASIC FUNCTIONS: To perform duties directly related to the care of livestock, to operate and maintain equipment; and to interact with tourism activities. As a Drover one must have the ability to effectively ride a horse in a safe manner to direct cattle on a pre-determined path. 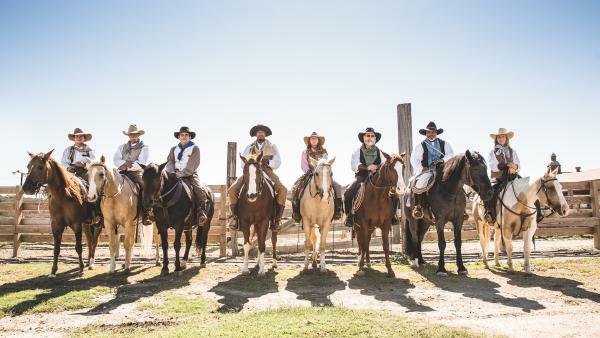 Be able to handle cattle from foot and horseback. Speak to the public and interact with guests. All applicants must pass background check and pre-employment drug screen.